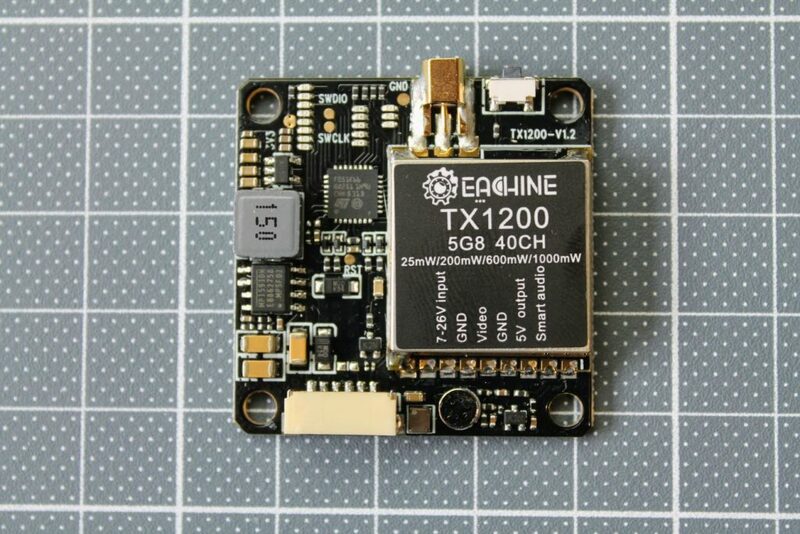 Eachine TX1200 is 30x30mm stack mountable, long range VTX. 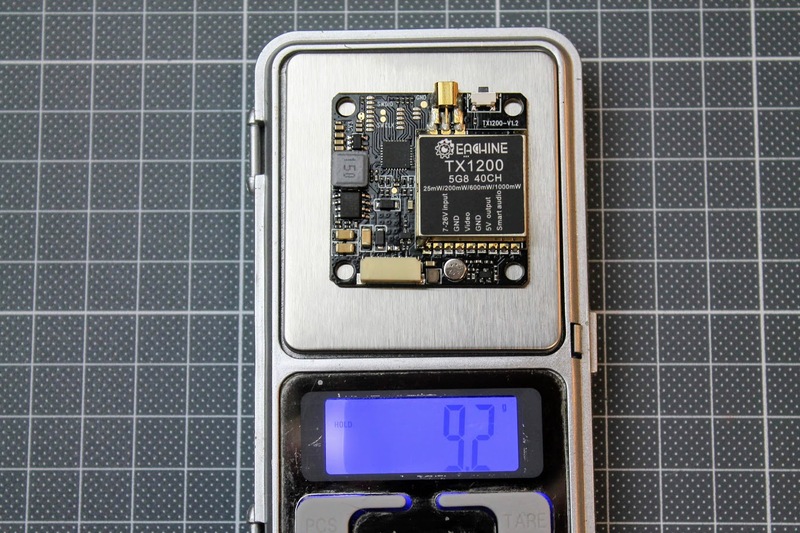 It has 5 bands, 40 total channels (including illegal channels 4, 7 and 8 on the band E, according to the FCC regulations), 4 power levels 25/200/600/1000mW (actual power output measured below) and PitMode, SmartAudio for controlling the VTX settings remotely via Betaflight OSD, microphone on board for broadcasting audio together with video feed. 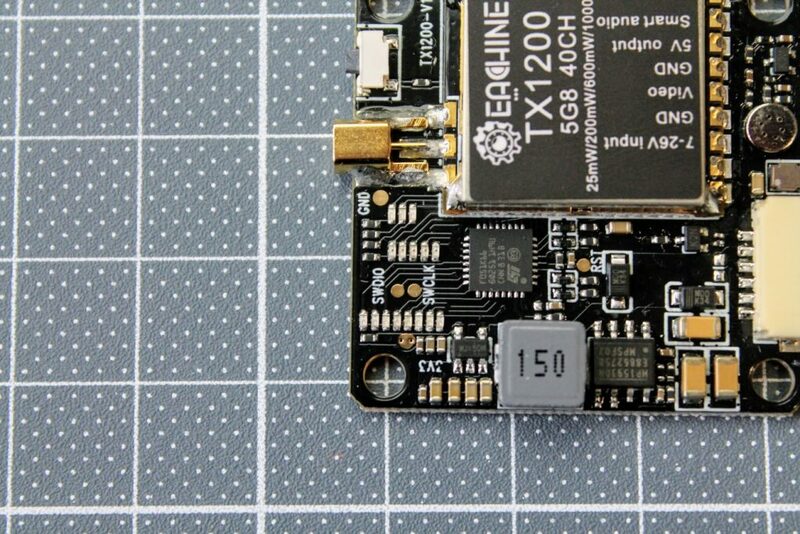 Eachine TX1200 VTX has MMCX antenna connector which provides more solid and tight joint than small IPEX connector. 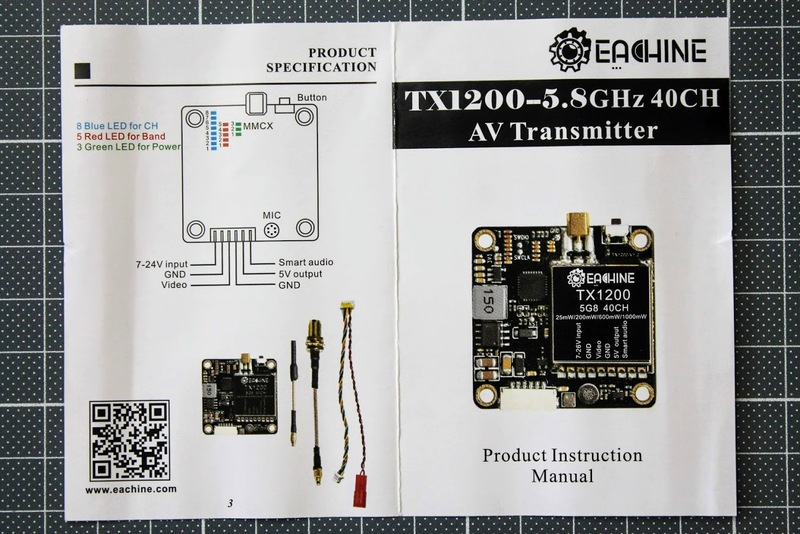 Eachine TX1200 package comes with a VTX, MMCX linear dipole antenna, MMCX to RP-SMA or SMA adapter pigtail (can be selected on purchase), cable with 6pin 1.25mm JST-GH plug and a small instructions leaflet. Eachine TX1200 has MMCX antenna connector and the settings button next to it. Button is placed on the side usually located in the back of the stack and it will be difficult to reach it. Luckily the VTX has SmartAudio feature and setting by the button is not going to be needed. 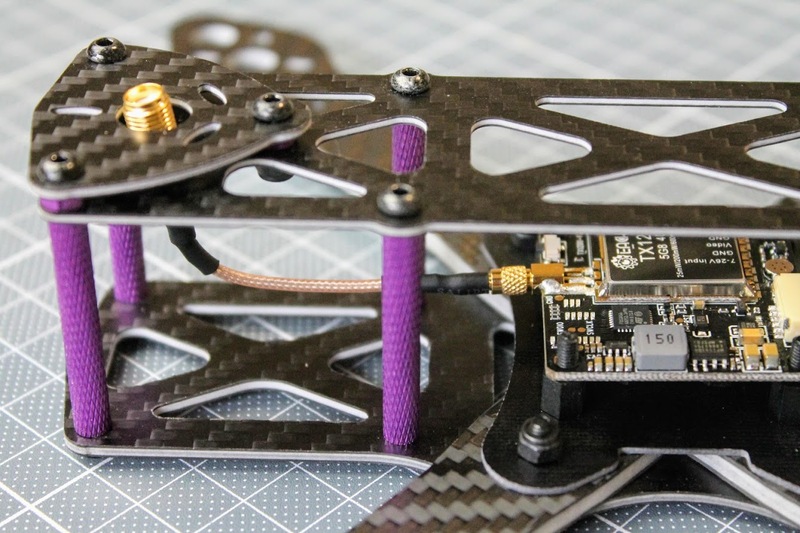 The back side of the VTX is totally flat, that makes it easier to install in the low height stack. You can also notice the ground plane of the voltage regulator is partially separated from the rest circuitly to minimize the interferencies int othe video feed. 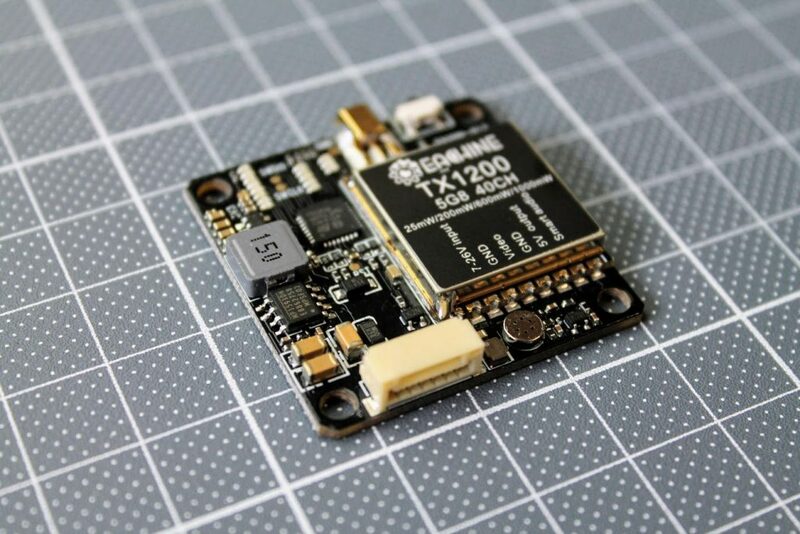 Eachine TX1200 has 3 groups of tiny LEDs for power, band and channel indication. 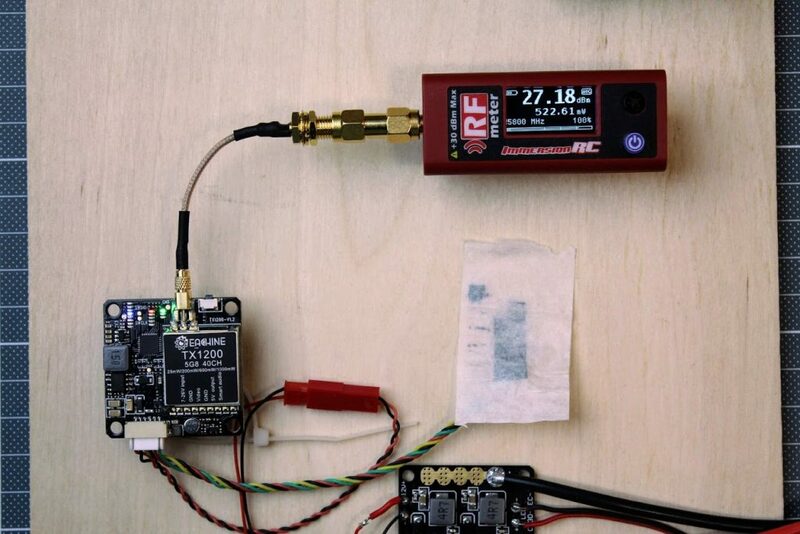 This helps to minimize the weight and height of the VTX. The weight of this VTX is 9.2 grams without wires and antenna pigtail. 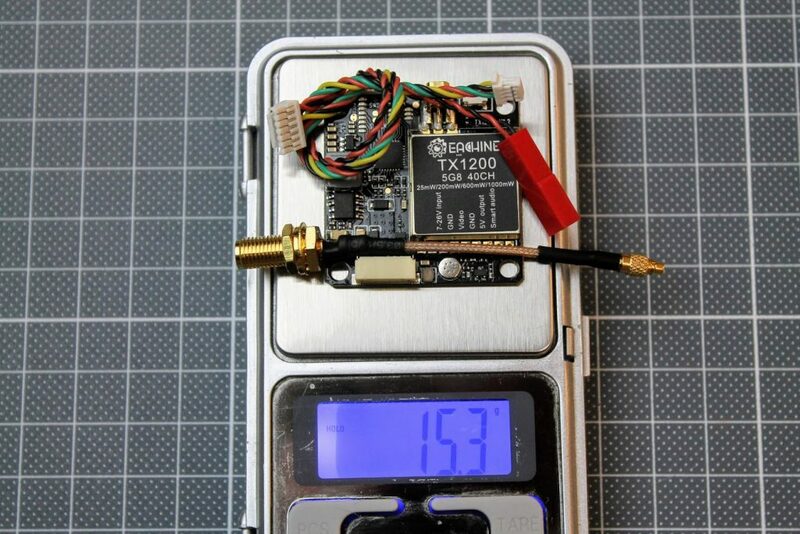 VTX weight with cables and antenna pigtail is 15.3 grams. Eachine TX1200 can be easily mounted in the quad if you have enought height for your stack. 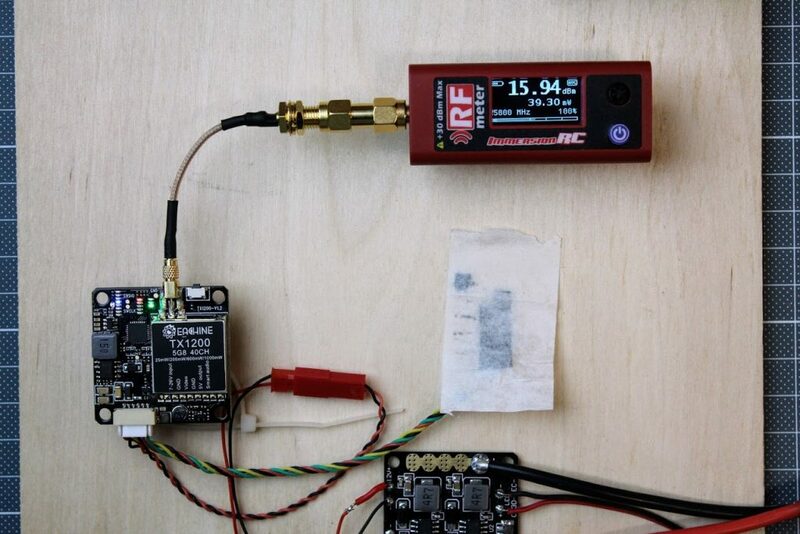 Eachine TX1200 was connected to the RF power meter via supplied MMCX pigtail. 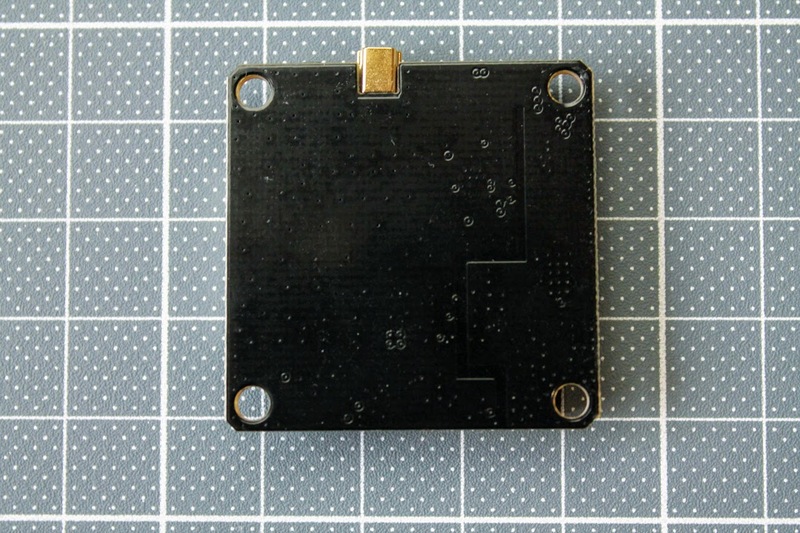 VTX was actively cooled with fan while taking the measurements. 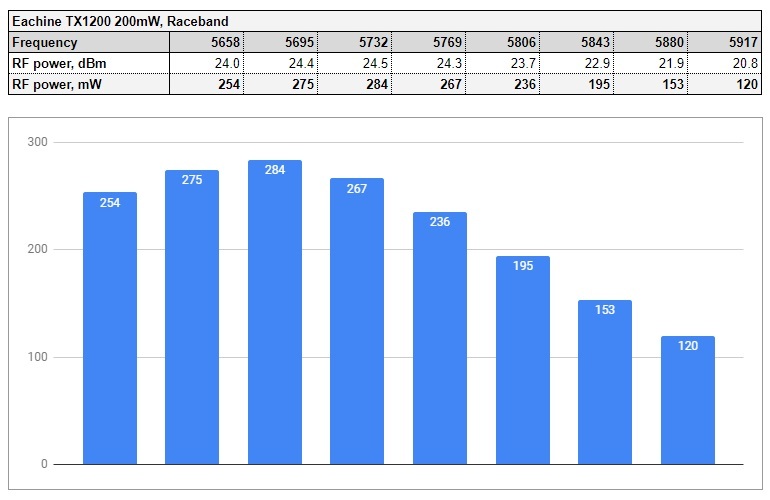 Also current consumptions were measured for each power output level. RF power output tests were made on R (Race) band, 5 channel (5806 MHz). First test: 25mW output setting. In the reality it is outputting almost 39mW (15.94dBm) and drawing 1.09W. Next step 200mW – outputs 240 mW (23.81dBm) and uses 1.88W. At 600mW setting it outputs the 522 mW (27.18 dBm) and consumes 2.96W. And at the max 1000mW setting it outputs only – 720 mW (28.58 dBm) and uses 5.20W of electric power. 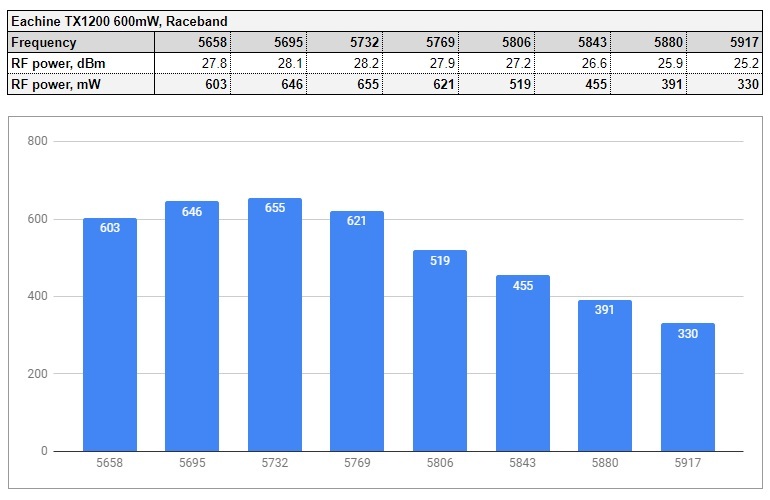 Power tests show that TX1200 VTX is calibrated to slightly outperform the power output setting – on 25mW power setting it exceeds the declared output and transmitts outputting 39mW. Also this VTX outputs more than nominal setting on 200mW and 600mW power levels. 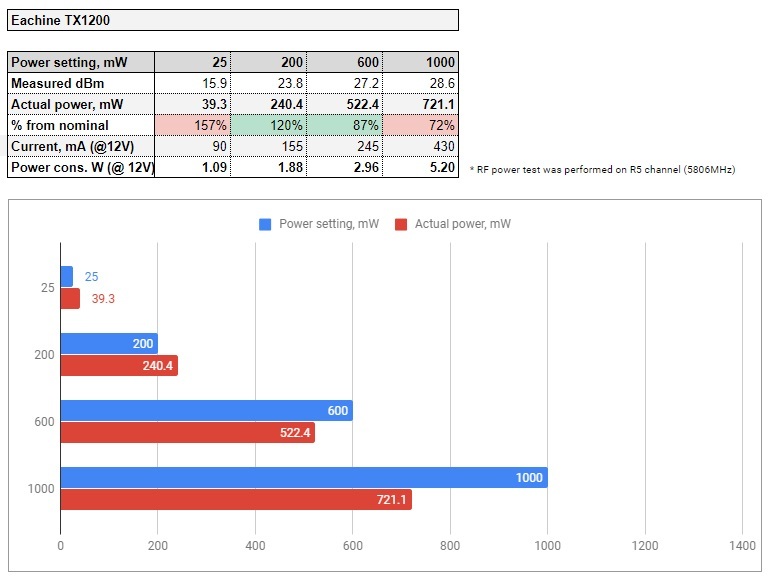 Extensive tests on power output linearity shows that power output is varying greatly, see the tables below. Blue bar is expected value and the red bar is real power output. Eachine TX1200 is the VTX designed specifically for quads as it fits directly into the 30x30mm stack. This VTX has all the required features for a modern VTX: audio microphone on board, MMCX antenna connector, SmartAudio control, 40 channels and 5 switchable output power modes. It offers a wide range of the power output levels from 25mW up to 1000mW. 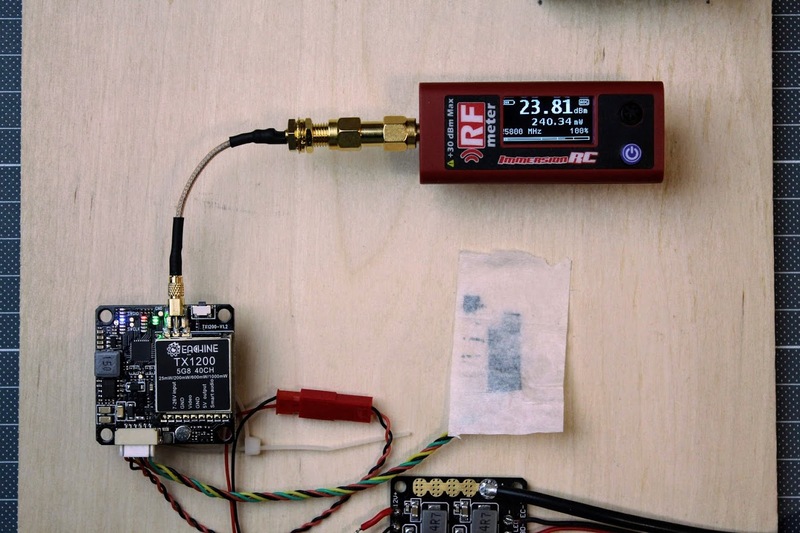 I would call this VTX a long range quad VTX as it outputs whole 1 watt of RF power. 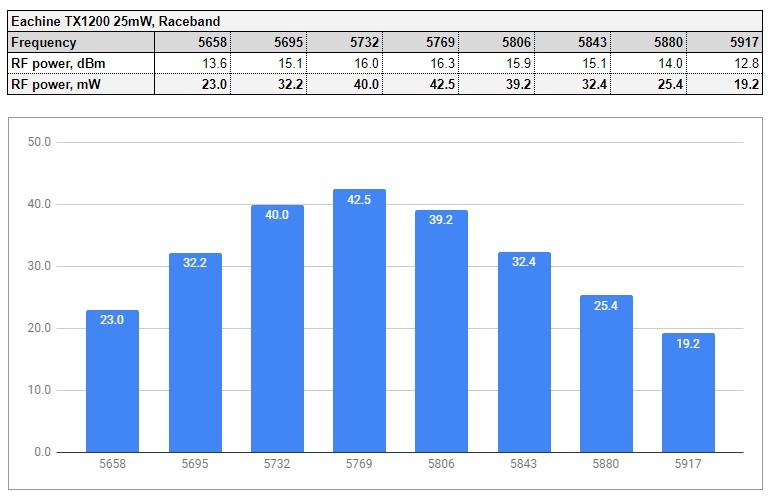 However TX1200 power output is varying greatly from channel to channel – on 1000mW settting it varies from 563mW (on R8 channel) up to 1040mw (on R1 channel). On 25mW setting it varies from 19mW (R8 channel) to 43mW (R4 channel). 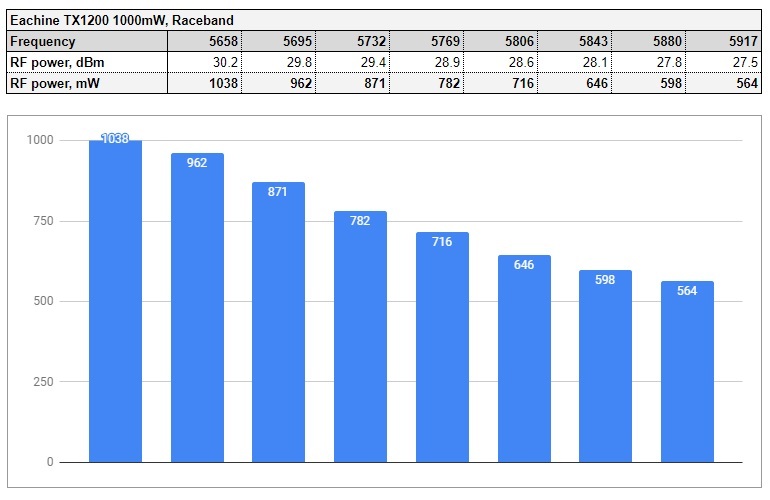 Interesting, that TX1200 looks to be calibrated on the Raceband channel 1 (R1) – power output is almost equal to the setting value on this channel. 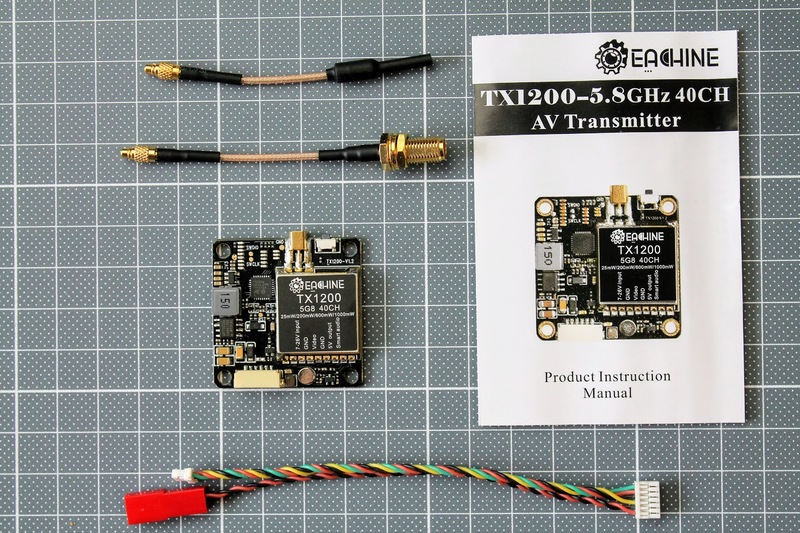 Final word: If you are comfortable with the RF power level deviations, then TX1200 can be good VTX candidate for your long range quad. 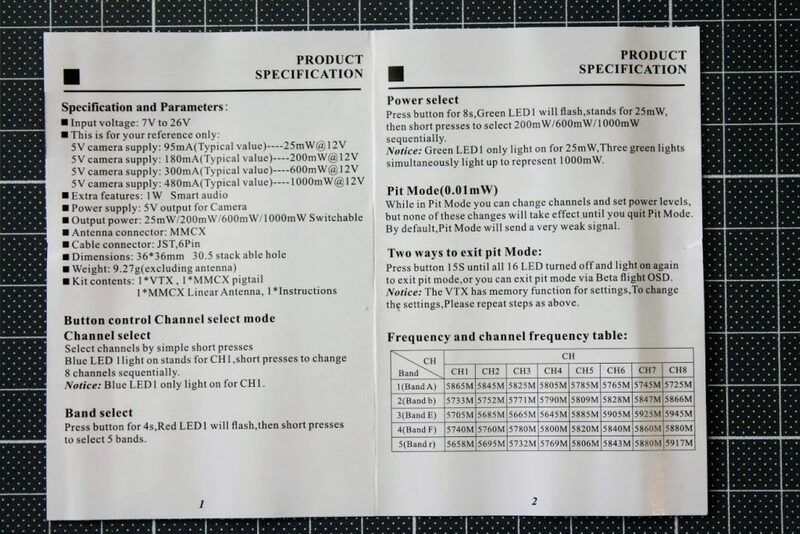 Disclaimer: This item was supplied by Banggood for a fair and unbiased review. Banggood never asked for a positive review and never infuenced my opinion in any way. I’m trying my best to stay uninfluenced and give only my own opinion. All affiliate links if there are any help me purchase items for future reviews.